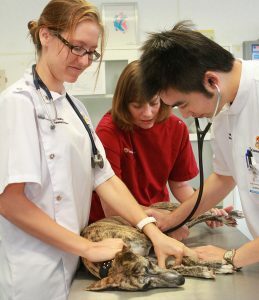 As well as providing a top class general practice, Uni Vets Camden provides an invaluable teaching experience for Sydney University’s final year (year five) veterinary interns. Clients attending the service will often have a brief initial consultation with one of our student interns followed by a thorough examination by one of our highly qualified supervising veterinarians. This gives our student interns a great opportunity to gain hands-on experience with the added benefit of having all their findings verified by our experienced clinicians. We appreciate our client’s involvement in this process, aiding in training the next generation of veterinary practitioners.